Quite simply, The Pearl of Tiger Bay is a treat. When Annie moves with her family to the seaside town of Tiger Bay, she finds a place full of secrets, mystery and a strange sadness. Most mysterious of all is Madame Olenka, who lives in the Pearl, a grand dilapidated hotel on the cliff above the township, and has not spoken to anyone in thirty years. There are two elderly characters in The Pearl of Tiger Bay. One is Por Por, Jin’s ghostbusting grandma and the other is Madam Olenka, a strange old lady who lives in a dilapidated hotel that overlooks the town. The Pearl used to be a world famous hotel in its heyday, but when Madam Olenka lost her little girl thirty years ago, she shut the place down and locked herself inside, refusing to speak to anyone. With the closure of The Pearl, the little town of Tiger Bay seemed to die too. The inspiration behind this book came from the time when I snuck into a spooky old mansion with my best friend Wendy when I was nine years old. 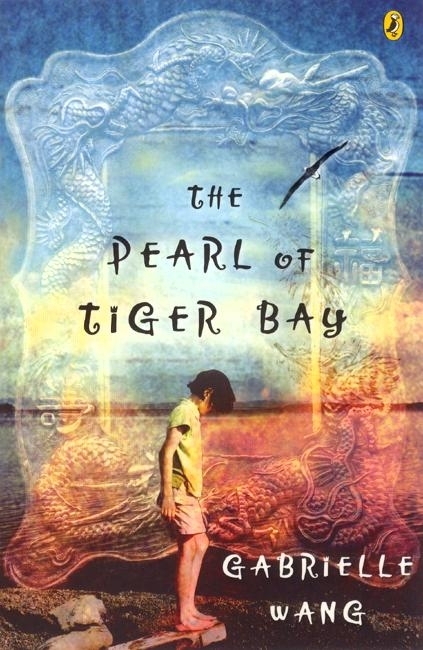 A Ghost in My Suitcase is a prequel to The Pearl of Tiger Bay. The photo you see below was taken at the Dromkeen Literary Lunch where I was invited to speak. Here I am with actors from No Mates Theatre Group. They dressed up as characters from The Pearl of Tiger Bay. Anotoly Sawenko is The Great Mironov, David Peake is Doo Doo, and Nicole Smith is Madame Olenka.